Nelson Agholor (PHI) 23 pts: He’s one of my draft steals in redraft leagues. He showed up and delivered on Sunday, catching 8 of his 12 targets for 88 yards and a score. Not bad at $6,100. With Agholor’s emergence and Carson Wentz return, grab him again, especially since his salary remains untouched. Tevin Coleman (ATL) 19.5 pts: Solid performance for his price tag, rushing for 107 yards on 16 attempts (6.69 YPC) and 4 receptions for 18 yards. Matty Ice returned to his 2016 MVP form and vultured 2 TDs from Coleman. James White (NE) 15.4 pts: With the arrival of rookie Sony Michel, White didn’t do much on the ground (11 yards). But, he did haul in 7 of his 8 targets for 73 yards. He’s averaging 15.5 pts per game. With his salary at $4,000, he’s always a solid flex play. 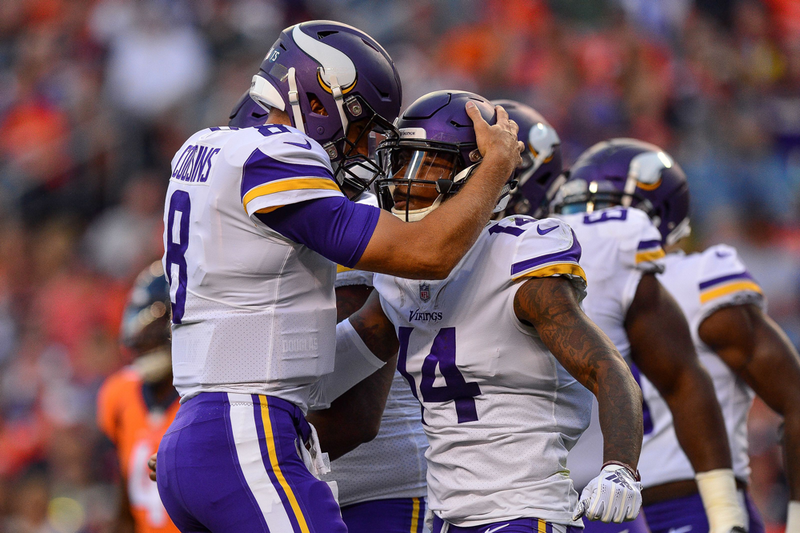 STACK / Kirk Cousins (37.5 pts) + Stefon Diggs (38.9 pts): I’m saying it now. Cousins will be a top 3 MVP candidate this season. Stefon Diggs will finish as a top 5 WR. 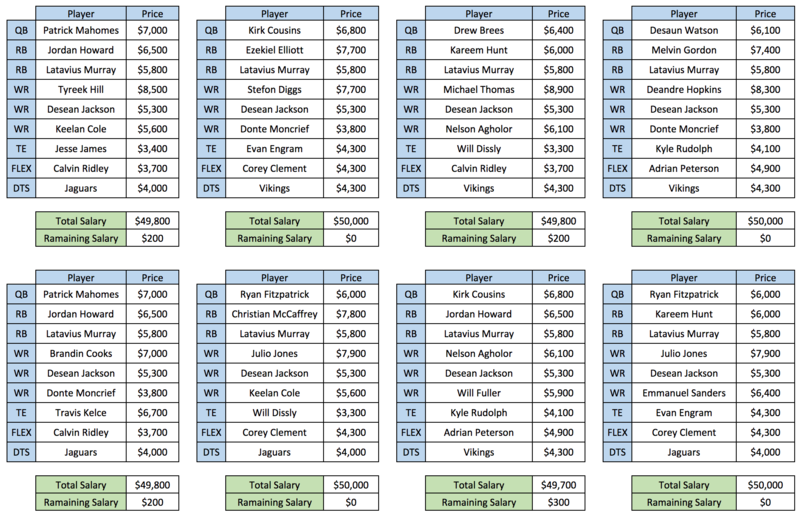 In my first article “Stacking: By the Numbers,” I advocated for this stack in season-long, redraft leagues. Who’s upset with themselves for not drafting either of these two? Not this guy. STACK / Drew Brees (17.6 pts) + Michael Thomas (31.9 pts): Thomas could very well be this year’s Antonio Brown and finish as the top WR in fantasy. According to CBSSports’ fantasy stats generator, he’s projected to finish 9 pts ahead of AB. Thomas is the WR I targeted in every single draft. He’s in 90% of my lineups. As far as Brees is concerned, he’s not putting up monster numbers alone, but he fits in this stack nicely and his price tag dropped $800 this week. STACK / Deshaun Watson (26.8 pts) + DeAndre Hopkins (26 pts): It seems that Mahomes is this year’s Watson, circa 2017. However, I have faith that Watson will find his way back to superstar status again. He’s still playing extremely well. He just needs both Fuller and Hopkins in the game. When he does, he rocks it. 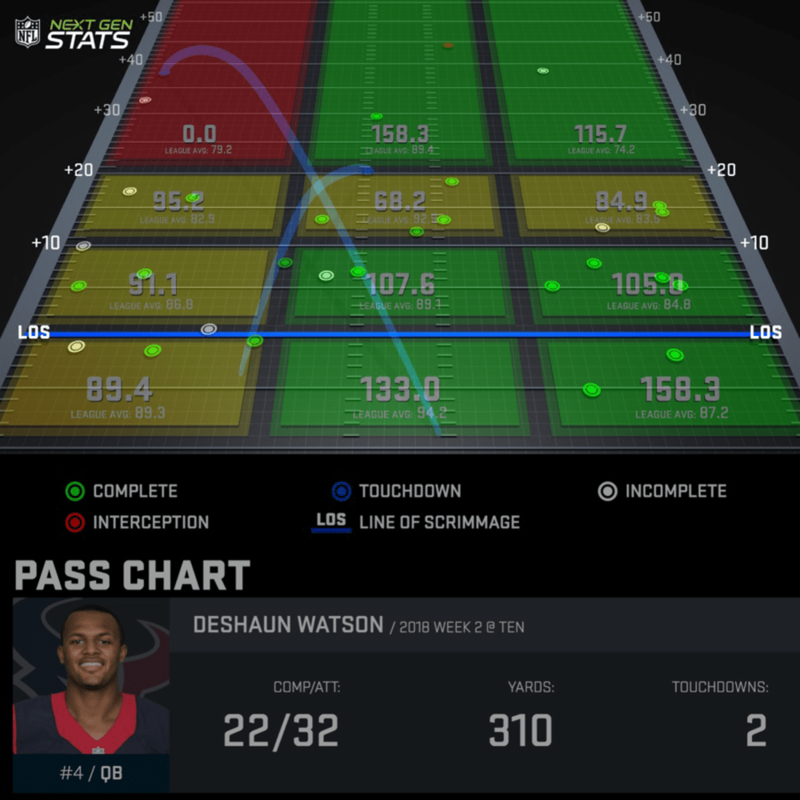 Side note: Also, Watson needs to look at his own analytics. Below is last week’s performance. 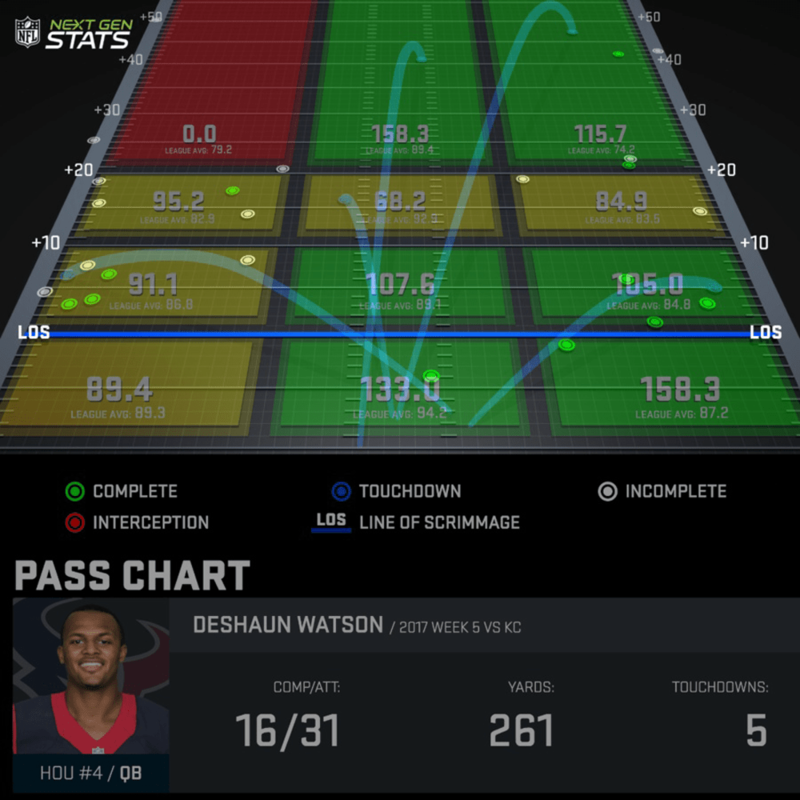 I overlaid Watson’s week 2 performance and his 2017 passer rating chart, by field position. Notice how he’s more proficient on the right side of the field as opposed to the left. 6 of his 10 incomplete passes were thrown on sections of the field where he holds an average passer rating. Now take a look at week 5 of last year. Here you can see 4 of his 5 TDs were on the right side, where he excels. In time, as the season progresses, he’ll find his rhythm again. Again, the key is having Fuller in the game. Fuller was out week 1 and Watson’s numbers were dismal. Jordan Reed (WAS) 10.5 pts: The Redskins only scored 9 points last week. Reed wasn’t a part of it. He did pull in 6 receptions on 8 targets, but it didn’t mean much without a TD and his lost fumble. Adrian Peterson (WAS) 8 pts: Yes, I said he should be good for 20+ touches and yes, I was wrong. Washington thought it’d be a good idea to only give him the rock 11 times. That’s not going to cut it for AP. It didn’t work out for the Redskins either. Isaiah Crowell (NYJ) 5.9 pts: The game Crowell had on Thursday was the game I expected him to have last week. Instead, the Jets struggled and in turn, Crowell didn’t see the goal line or red zone touches that he just received against the Browns. Nick Foles (PHI) 19.7 pts: Against Tampa Bay, Foles should have dominated. I guess he needs to play against playoff caliber teams to excel, proving once again that Nick Foles is still Nick Foles – the best back-up QB in the league. 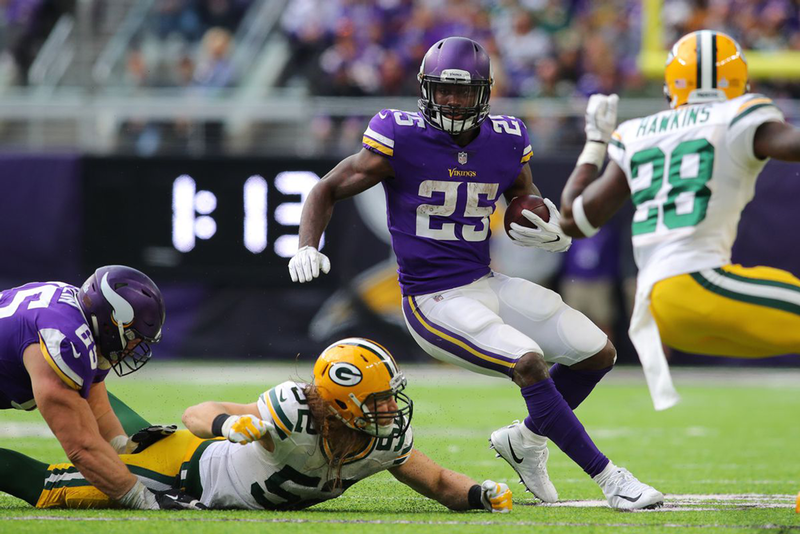 Latavius Murray, RB (MIN) $5,800 – It was just announced that Dalvin Cook is out for the Vikings’ contest against the Bills. Cook owners, sad. Murray’s owners, rejoice. DFS players, capitalize! Let’s be honest, the Bills are this year’s Browns. In referrence to points scored against, the Bills rank 17th against the pass, 22nd against the run, and dead last in total points (thank you Joe Flacco). Cook’s price was $7,100. That’s quite a savings and my top steal of the week. Keelan Cole, WR (JAX) $5,600 – Week 1 was a bust. However, Cole had a big game last week, going 7 of 8 for 116 yards and a TD. His ridiculous, one-handed sideline catch was reminiscent of OBJ against Dallas in 2014. Tennessee gives up an average of 255 passing yards per game. He is clearly the more talented WR in Jacksonville. DeSean Jackson, WR (TB) $5,300 – Somehow, D-Jax is still relatively cheap considering he currently averages 30.0 FPPG, over two games. With Mike Evans at $7,800 and Chris Godwin dealing with a toe injury, I expect the Bucs to continue to roll through the air against the Steelers, who just gave up 6 TDs last week and tied with the Browns in week 1. Corey Clement, RB (PHI) $4,300 – Both Jay Ajayi (back) and Darren Sproles (hamstring) are out. He did score 19.5 pts last week with Ajayi in the rotation and between Clement and Smallwood, we already know who this week’s lead back is going to be. Donte Moncrief, WR (JAX) $3,800 – He’s the cheeper flex option. No, he’s never truly been fantasy relevant. 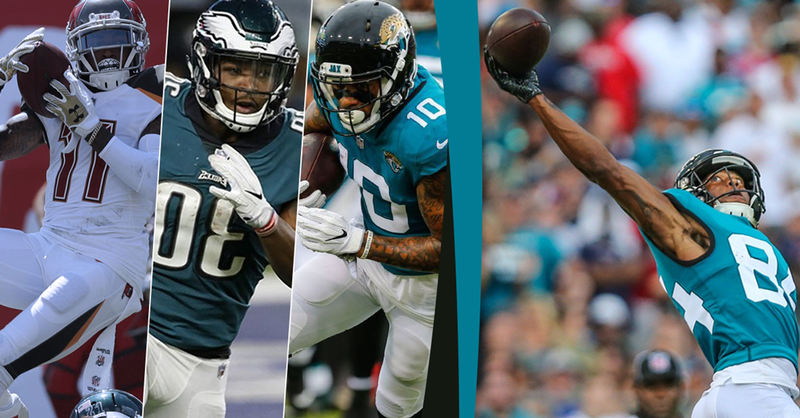 But, consider last week’s top 3 target shares in Jacksonville: Westbrook (5), Cole (8), Moncrief (9). Yes, he was Bortles most targeted WR. Just keep in mind that at his salary, he’s a flex option that’s TD dependent and that’s okay. Here’s this week’s recommended rosters; meant to give you a few ideas of how to balance your line up. The salaries and fantasy point totals are taken from Draft Kings. Entering 50/50 contests is the absolute best way to win and double your money. If you decide to go all in and chase the big money, just be sure to enter a few 50/50s to ensure you win your money back. Good luck this week and make your opponents weep.